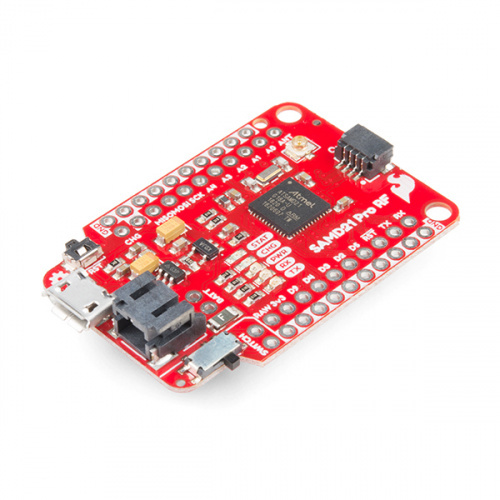 The SparkFun SAMD21 Pro RF is the fated meeting of a SAMD21 and a long-range RFM95W LoRa®-enabled radio. The outcome is a compact, blazing fast microcontroller with excellent point to point data transmission in the 915MHz ISM radio band with LoRa capabilities. 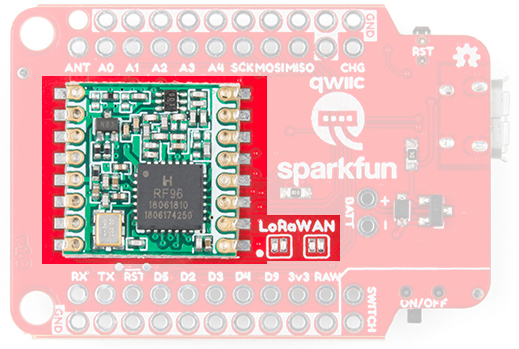 In this tutorial we'll break down the capabilities of the development board, give you a brief introduction to LoRa and get you familiarized with the two Arduino libraries that will get you started with the radio and LoRaWan. If you're familiar with LoRaWan then skip ahead to the Hardware Overview, otherwise let's get started with a brief introduction to LoRaWAN. You can power the SAMD21 Pro RF with any of our stocked LiPo Batteries that is above 500mAh. If you're not familiar with the following topics, or want a more in depth conversation related to the following, please follow the links below. This scheme allows for data to be transmitted to the LoRa Network over a specific radio band known as the the Industrial, Scientific, and Medical Band (or ISM band for short). The frequencies of this specific radio band varies from country to country but as an example, the SAMD21 Pro RF will broadcast within the range of 902-928MHz in the Americas and in the range 863-870MHz in Europe. We reference the spectrum of broadcasting frequencies by its' center frequency, 915MHz in the Americas and 868MHz in Europe. Ok, we have a general idea that we broadcast in a band of frequencies using a technology that translates data into radio signals, but how do we get from the SAMD21 Pro RF to the "Internet of Things"? Broadcasting and uploading requires three things: a Node, a Gateway or Concentrator, and a Network Server. The "Node" in this case is the SAMD21 Pro RF, which will broadcast its information into the void and hope that there is a Gateway or Concentrator nearby to hear it. A Gateway or Concentrator will take the information your node is broadcasting and push it to a Network Server like the The Things Network or Resin.io. Let's read that in a different way, the Gateway or Concentrator takes the radio waves, demodulates them (i.e. translates them), and puts that information onto the Internet. Neat! Now it's here on the Network Server that we get to interact with that data. For a more in depth explanation about LoRaWAN, check out this great tutorial. Want to setup your own Gateway? Check out the tutorial below! If this is your first time with the SAMD21 then check out our great write up on the hardware specifications of the SAMD21AG MCU and see how it compares with an ATmega328P. 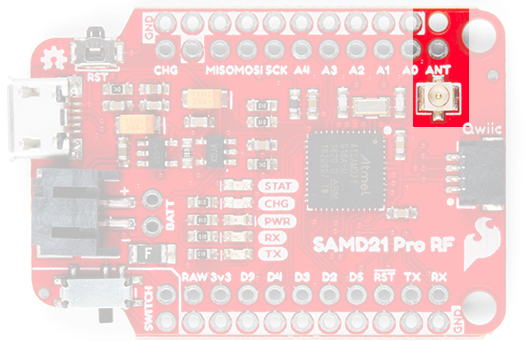 Let's move onto the SAMD21 Pro RF and its hardware features. You can power the SAMD21 Pro RF in a number of external 5V sources. At the head of the board, you'll see a micro-B USB connector and a lithium polymer battery connector that will take any of our stocked LiPo battery options. To safely charge, we recommend using a LiPo with a capacity that is higher than 500mAh. Note the two plated through holes just to the right of the LiPo connector that can be utilized for direct soldering of a LiPo Battery. Next to the switch, you'll see the pins labeled RAW for a external source of 6V or below. Charge Rate: The onboard charging circuit is set at a default charge rate of 500mA. If your are using a LiPo battery with capacity below the set charge rate, we recommend adjusting the MCP73831's programming resistor or charging separately using the SparkFun Adjustable LiPo Charger to safely charge the LiPo battery. Warning: Powering the SAMD21 Pro RF is easy but the onboard low noise, low dropout voltage regulator can not handle anything above 6V. Please be attentive with how you power it. Logic Levels: Keep in mind that this is a 3.3V system, which interfaces nicely with our Qwiic environment and other 3.3V devices. If you are using the SAMD21 Pro RF with your external 5V devices, we recommend adding a level shifter in between. Below is a table with every pin on the SparkFun SAMD21 Pro RF and it's function. This product carries the full gamut of LEDs we've come to expect on SparkFun development boards: STAT LED, CHARGE LED, RX/TX indicators, and a Power LED. The STAT LED is on pin 13, typical on most Arduino boards. The RX and TX LEDs indicate activity on the USB serial port and are also available through the Arduino IDE using the macros PIN_LED_RXL and PIN_LED_TXL as your pin declarations. These LEDs are active-low, so writing the pin HIGH will turn the LED off. The charge LED is controlled by the onboard MCP73831 and lights up when a battery is being charged and turns off when the battery is full. 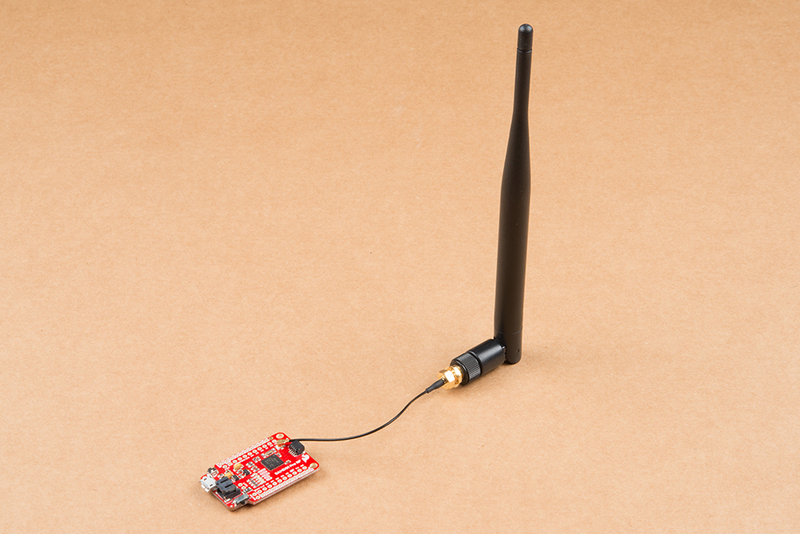 The RFM95W Radio Module is a powerful but low power module that allows for point to point radio communication. It also has the capability of utilizing the Long Range Wide Area Network (LoRaWan) by closing two LoRaWAN labeled jumpers on the underside. There are two options for an antenna on the SAMD21 Pro RF, a wire and a u.FL connector. The plated through hole and the connector are both labeled by the same ANT silk on the topside of the product. When using the through hole for your antenna, notice the unplated hole just above it. The purpose of this hole is to thread the wire antenna through it so that it takes the stress of daily wear and tear off of the solder joint. Woot! How Much Wire Length Do I Need? Another option is to connect a LoRa Antenna to the u.FL connector. The image below uses the 915MHz antenna. Make sure to select the appropriate antenna for your region. On the tail end of the product is a Qwiic connector. If you are not familiar with the system, you can get a full rundown here. In short the Qwiic system is an I2C environment of products that can be rapidly prototyped because we've broken out the I2C lines: ground, power, clock, and data, to a four pin JST connector. There's no need for solder or a soldering iron and our catalog of products with a Qwiic connector are growing rapidly. Here the SAMD21 ProRF is connected to the Qwiic Triple Axis Accelerometer. This topic is mentioned in detail under the SAMD21 Dev/Mini Breakout Hookup Guide but it's worth restating again here. Depending on the task it's given, the SAMD21's core will usually consume between 3-17mA. There should be plenty of juice left from the 600mA 3.3V regulator to power other sensors or components off the board's 3.3V supply rail. If for example, you're sourcing current to four LEDs tied to pins 0, 1, 3, and 4 (cluster 4), the sum of that current must be less than 14mA (~3.5mA per LED). On a related note, Cluster 3 is mostly occupied by the Radio's various inputs: interrupt, chip select, and reset as well as the Qwiic Connector. Heads up! Please be aware that the SparkFun SAMD21 Pro RF is NOT currently supported on Windows 7/8 due to a lack of support drivers for those specific OS's. Update Arduino! This setup requires at least Arduino version 1.6.4 or later. We've tested it on the latest version – 1.8.5. If you're running an older version of Arduino, consider visiting arduino.cc to get the latest, greatest release. 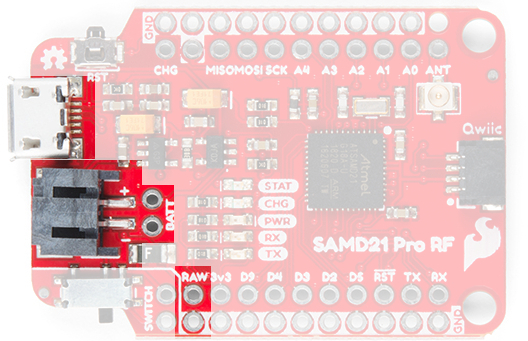 While the SAMD21 is powerful and completely supported by the Arduino IDE. 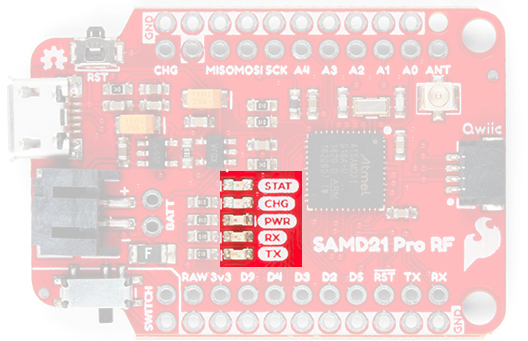 This following section will list every step required for installing the SparkFun SAMD21 Pro RF into the Arduino IDE. First, we'll install the SAMD board definitions via the Boards Manager in the Arduino IDE which contains a variety of tools, including low-level ARM Cortex libraries full of generic code, arm-gcc to compile your code, and bossa to upload over the bootloader. To install the Arduino SAMD board definitions, navigate to your board manager (Tools > Board > Boards Manager...), then find an entry for Arduino SAMD Boards (32-bits ARM Cortex-M0+). Select it, and install the latest version. At the time of this Hookup Guide, version 1.6.19 was used. 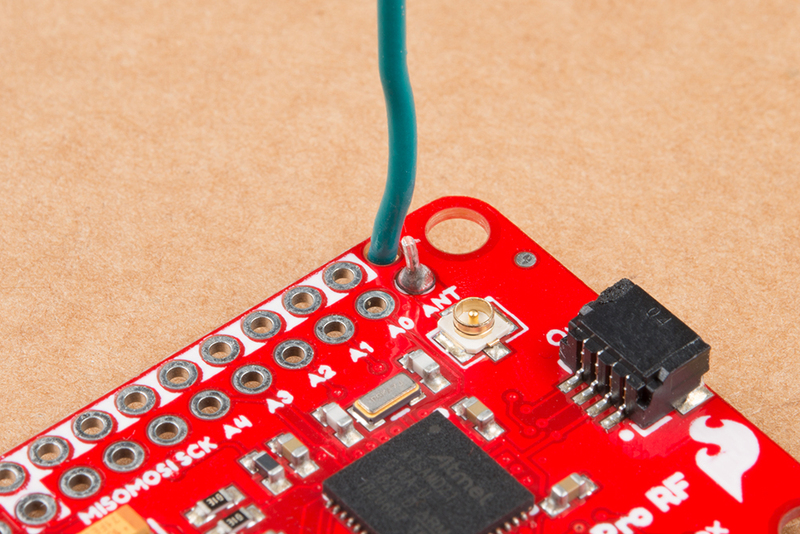 If you've done this before with different development boards, then you can add the SparkFun link text to the end of the text, just add a comma between seperate links or click on the small square to the right of the field and add it to the bottom of the list. Now hit OK, and travel back to the Boards Manager menu. 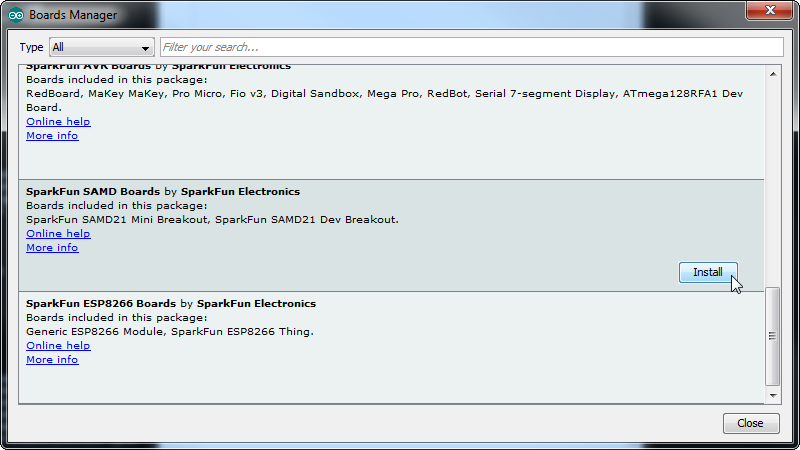 You'll now see a new entry for SparkFun SAMD Boards. If you don't see it, close the boards manager and open it again. ¯\_(ツ)_/¯. This installation should be much faster; you've already done the heavy lifting in the previous section. You're update should be 1.5.2 or later! 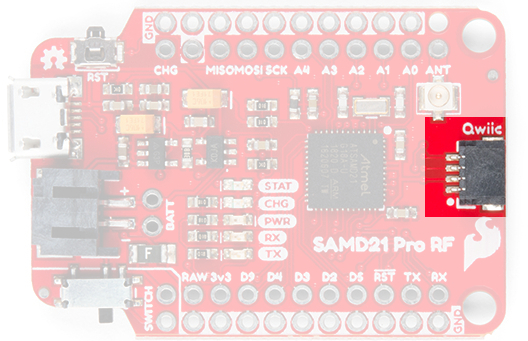 Once the board is installed, you should see a new entry in your Tools > Board list: SparkFun SAMD21 Pro RF. Finally, select your SAMD21 Pro RF Board's port. Navigate back up to the Tool > Port menu. The port menu may magically know which of your ports (if you have more than one) are the SAMD21 board. On a Windows machine, the serial port should come in the form of "COM#". On a Mac or Linux machine, the port will look like "/dev/cu.usbmodem####". For this example we'll be utilizing the Radio Head Library to utilize the RFM96W Radio Module. You can download the Radio Head library from its' GitHub repo, or click the link below. 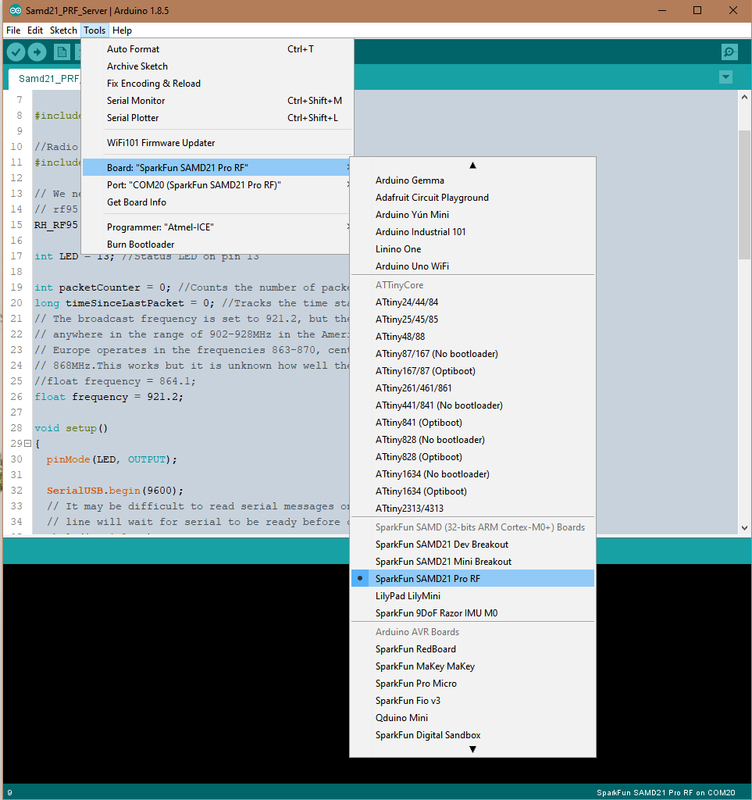 While you're clicking on buttons, all of the Arduino example code can be downloaded by downloading it from the SAMD21 Pro RF Arduino Examples GitHub repo or clicking the second button below. One last thing before we go any farther. The SAMD21 is a highly versatile chip and we've taken advantage of that fact by creating two seperate UART lines, one that interfaces with the computer through the micro-B and another one broken out on the RX/TX header on the side of the board. To communicate to the Arduino IDE's serial monitor, we'll be using the statement SerialUSB, rather than the normal Serial that you might be used to. Are they different? Nope! Just different nomenclature for different UART lines. Note: For the following two examples to work you'll need one radio module to send your message and another to hear and respond. This example uses two SAMD21 Pro RF's communicating to each other operating in the Americas at 915 MHz. If you are using the SAMD21 Pro RF's in Europe, make sure that you have the antenna length adjusted for 868MHz and set the frequency variable. Assuming that the Arduino library you downloaded and installed is working correctly, let's move onto our first example. This example and the following example build off of the sample code provided by the RadioHead library but has been tailored for the SAMD21 Pro RF. // rf95 instance below.On the SparkFun ProRF those pins are 12 and 6 respectively. // anywhere in the range of 902-928MHz in the Americas. // line will wait for serial to be ready before continuing. Comment out if not needed. // An LED indicator to let us know radio initialization has completed. // Transmitter power can range from 14-20dbm. Both the TX and RX ProRF boards will need a wire antenna. We recommend a 3" piece of wire. // Europe operates in the frequencies 863-870, center frequency at 868MHz. // will wait for serial to be ready before continuing. Comment out if not needed. //An LED inidicator to let us know radio initialization has completed. The "Server" and "Client" nomenclature may be a bit misleading. It might be more accurate to say "call" and "call-back". None the less, there are a few notable changes made from the original examples. RH_RF95 rf95(12, 6) -- Pin 12 and pin 6 are the assigned pins that run to the RM95 Radio Module's chip select and interrupt pins. while(!SerialUSB)-- When the SAMD21 Pro RF starts up, it's not always a smooth transition and messages meant for the serial monitor will get missed. This line will hold your code hostage until you open the serial monitor at which point it will continue on. We have two UART lines for this microcontroller, the one that communicates with the serial monitor is called using the keyword SerialUSB. rf95.setFrequency(frequency) -- The default frequency is kind of random, 921.2 but it falls within the American ISM band: 902-928MHz. If you're in Europe, that band is 863-870MHz. You'll find the variable "frequency" is set a little higher up in the code. After you upload the code to two SAMD21 Pro RF's, open a serial monitor set at 9600. You should see the following readout in the serial monitors! Click the image for a closer look at the output. For this example, we'll be setting up the SAMD21 Pro RF as a node using a library written by Matthijs Kooijman which is a modified version of "IBM's LMIC (LoraMAC-in-C)" library. 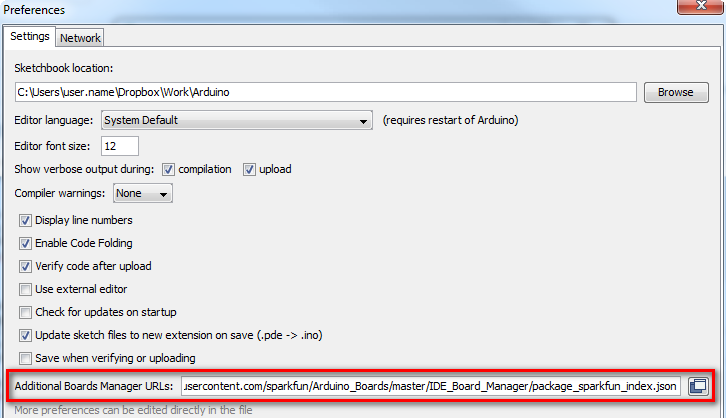 You can download it through the Arduino Library Manager under "LMIC-Arduino". You can also download and manually install it from the GitHub Repository, or click the button below to manually install it from there. This example requires that you have an account with The Things Network and a nearby gateway. Read the brief introduction above to learn about nodes, gateways, and network servers. First, we'll need an account at The Things Network which will provide us our network server to manage, graph, and/or look at our data in the case of our "Hello World" example below. On the front page of the website there's a map that shows active gateways in your area. If you don't have a gateway nearby, you can set one up using SparkFun's ESP32 1-Ch Gateway, using this excellent set up guide here. This is the gateway that I chose to use for this example. This rest of this example assumes that you have an account with The Things Network. It's free and only requires an email address! Before you can upload with the SAMD21 Pro RF, you'll need to sign up for an account on their website. Registering with their website is free, and allows the network to generate the necessary keys which identify your projects and nodes. Give your application an Application ID (identifier); this is the name that The Things Network will use to distinguish it from the other applications. It can only contain lowercase letters, numbers, and dashes. The description field is for humans, so take a moment to write a sentence about what your app does. In this case, I've just written that it's an example application. The EUI will be issued by the network, so there's no need to type anything there. Finally, select the handler that you want your application to be registered to. Essentially, these are instances of the network server in different physical locations around the world. All applications will talk to all network servers, but to minimize latency, it's best to select the handler closest to your gateway. SparkFun is located in Colorado, so I chose "ttn-handler-us-west," which I assume is in California somewhere. Click the Add Application button and you'll be taken to your freshly generated application console. We'll need these keys to program your SAMD21 Pro RF so leave this page up on your browser and let's open up the Arduino IDE. It's time to program the node! This modified example takes directly from the example code provided by the library with a two changes: the function calls to "Serial" have been replaced with "SerialUSB" and changes to the pin mapping that is consistent with the SAMD21 Pro RF. Before we look at the code you'll first need to modify the config.h file that came with the LMIC Arduino Library. Since we're using the 915MHz radio module in the US, you need to make sure that the line #define CFG_us915 1 is not commented out and that the line #define CFG_eu868 1 is, by prepending // as shown above. Same goes for the radio type, we want #define CFG_sx1276_radio 1 and not #define CFG_sx1272_radio 1. Notice how the first "#define" contains "eu868", short for Europe and its center frequency. The line we un-commented contains "us915" which is undoubtedly for United States, with its center frequency at 915. With those changes made, save the config.h file and return to the Arduino IDE. In order to make it work with your application you'll need to copy in some keys from the Device Overview page on your TTN Console, so flip back to the browser tab with the Device Overview page loaded up. You'll notice that, by default, the Network Session Key and App Session Key fields are obscured for security reasons. You can click the eye icon to show the code before copying it. Also, it will be easier to copy this into the example code if you click the <> button to show the codes in "C style", a bunch of HEX designated numbers. Heads up! The keys and address provided are not the same order as listed on the website. Notice the three lines at the top of the code that say "Network Session Key Here", "Application Key Here", and "Device Address here". These lines can be replaced by the keys from the website. // continuing. Uncomment if not needed. Below are a few modifications to the original code that have been made to tailor it to the SAMD21 Pro RF. while(!SerialUSB)-- When the SAMD21 Pro RF starts up, it's not always a smooth transition and messages meant for the serial monitor will get missed. This line will hold your code hostage until you open the serial monitor at which point it will continue on. 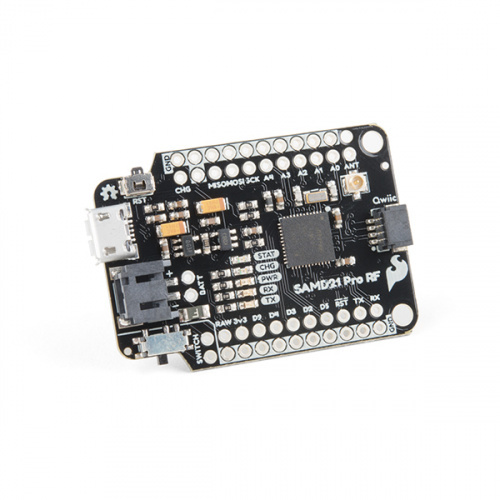 The SAMD21 Pro RF has two UART lines, SerialUSB references the one that communicates with the computer via the Micro-B connector. We've also had to change the pin mappings to be consitent with the reset, chip select, interrupt, and LoRaWAN lines of the RFM95W module. One last thing. On the underside of the SAMD21 Pro RF there are two jumpers labeled LoRaWAN. Closing these jumpers will tell the module that we're broadcasting in the modulation scheme unique to LoRaWAN. Upload the code and let's go back to the website and see what it looks like! Our packet has been decoded! Neat! For troubleshooting tips, checkout the SAMD21 Troubleshooting guide here for common issues that you might run into when uploading code to the SAMD21. 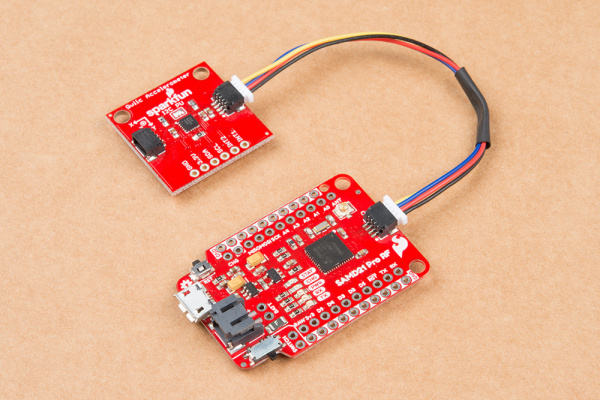 We recommend testing a pair of SAMD21 Pro RF boards with the point to point radio example to see if the boards are transmitting/receiving with the antenna and frequency to verify that the boards are working as expected. The SAMD21 Pro RF is a powerful microcontroller with LoRaWAN capabilities. To best take advantage of it, plug in a LiPo battery and a Qwiic enabled sensor. Perhaps you don't have a gateway nearby, or have found that they can be quite expensive? Look no further than our ESP32 LoRa 1 Ch Gateway with its excellent hookup guide. For more information about hte SAMD21 Pro RF, check out the links below. Product Repository -- GitHub repository where you can find all of our latest hardware and software design files. Arduino-LMIC -- LoRaMAC-in-C (LMIC) Arduino library used to create LoRaWAN devices. Arduino Example Codes -- All the examples used in this tutorial. 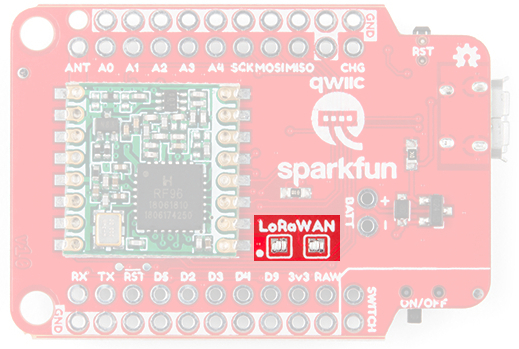 Introduction to LoRaWAN -- Sparkfun's beginner's guide to everything the Long Range Wide Area Network known as LoRaWAN. Looking to adding SERCOM ports for your SAMD-based board, check out the tutorial below.